Day 4 of February sneak peeks! Today is the last day of sneak peeks.....tomorrow is the big day to start collecting the new releases you can't live without! Aren't these little jungle animals by Wendy Hall adorable? We think so! I think the elephant is my favorite....or maybe the monkey? I can't pick! Now this little circle set is a must have if you are collecting the Stamps of the Month! Look what you can make with these sweet circles! FREE with a $50 order! These little cute quips work well with many of our dollar stamps, plus they work well with our new set Circle Somethings! I just love this little chick! What a springy way to just let someone know that you are thinking of them! This little mini cross coordinates with the cross from our Prayer Journal set.....I just thought I needed it! We hope to see you tomorrow for the big shopping day! Have fun! Day 3 of February sneak peeks! Welcome to day three of sneak peeks....ready to go to your happy place??? This set is so cute! Kim Teasdale did a great job illustrating this set....and the samples are wonderful! Go to the Idea Gallery for Hey, diddle diddle! Here is another customer request! We have had many requests for a gymnast set....didn't this set turn out just beautiful! Laurie did a great job! Oh, and here is a little hint....if you are looking for a male gymnast, we didn't forget about you....keep your eyes open next month! Don't forget the sentiments to go with the gymnast set or any sport set! These work great to use with any image you choose! We thought it was time for a new flourish set.....so Laurie came up with this beautiful set of flourishes for us! I just love these two sentiments.....we think you will too! I hope your day is filled with blessings and stamping galore! Post #2 Today... keep scrolling to catch today's sneak peeks! Hey friends, I hope you are enjoying the sneak peeks that we all look forward to at the end of the month. I am slipping in with our 6th Clearly Inspired Challenge so you not only have lots of eye candy, but something to get those creative juices flowing until you can shop for all those wonderful new stamps! A COLOR CHALLENGE - RED, BLACK, WHITE and feel free to add PINK to if you would like. Use any brand or shade that you have and/or like. Here are the basic details for our challenges, they are sweet and simple and one of you will definitely go away with a prize. And thanks to some of our lovely Design Team Members, I have some great inspiration to get you going. Thanks for joining us and make sure to come back every day until the end of the month to catch all the sneak peeks. Day two! You are going to love what you see! I have wanted some little praying children for a long time now, and Wendy Hall made my wish come true! The samples turned out so adorable with this set! I am going to make a little prayer journal for my girls to use when we pray.....it is one of the best ways to grow our faith! We wanted a cute little train set, and Laurie Wilson did an excellent job with this set! We had the discussion about whether it should be solid or outline...and we couldn't decide...so we did both! Again, my design team did a beautiful job with the samples for this set....just beautiful! My heart is to use my cards in a ministry capacity....that is one of the reasons I started Clear Dollar Stamps. I love to take cards to church for others to use, as well as send them out myself. I think this set is so versatile and can be used in so many ways: pair with a scripture verse, cards, little gifts for those that are hurting. This set is also very easy to use with a church card ministry as there is no coloring! I hope you enjoy! How pretty is this set? I just love carousel horses, so when Shawne Arnold showed me this set, it just took me to my happy place! Create cards, use this a framed picture, stamp on a lamp shade, use as a baby shower theme.....there are just so many possibilities! We have so much to praise God for in the United States! This stamp would even be good to make little magnets or reminder cards to place around your house to remind us to praise God in everything! Our favorite time of the month is letting you see what we have been working on! So let the sneak peeks begin! This is a very nice set! I know I will be using this set over and over to make quick and beautiful cards....sometimes we just don't have the time for coloring and this set will be just the ticket! Perfect for Birthdays, Anniversaries, or just an anytime card! Spring, summer, or fall this little set makes very elegant little cards. Use them as a background or focal point and don't forget to use these on your scrap pages! When you first see this set do you wonder what in the world you do with it? Well, we think you will be wonderfully surprised at the adorable cards, projects, and scrap pages you can create with this set! Keep scrolling to see what we have created! Just look at all the adorable images you can create with this set! Way too cute! Everybody loves nursery rhymes, don't they? This set is so cute to send to someone who is having a bad day....and it can be used for the men in your life! We all need more stamps for men! Our Value Verse for the month of February: remember these verses are sold at 20% off everyday! What pretty cards this little sentiments makes! You can use it as the focal point of your card or as the inside sentiment! Don't forget about our music sets to pair this with such as Sweet Symphony and Sheet Music! This little verse is a wonderful little addition to anyone's scripture stamps! Pair it with Nice Neighborhood or our little Birdhouse Duo to create adorable cards! A couple of other suggestions would be Home Sweet Hive and Home is Where the Hearth is. Hey friends, its Katie here to say hi on this lovely Tuesday. I've got a great little (actually not so little) Valentine treat bag to share with you. I was inspired by this bag and changed it over to paper. I wasn't sure how it was going to turn out but I think it is super cute and really quite easy. Here are the main materials for this project. Cardstock of choice, embossing folder of choice, Plain and Scallop Heart Nestabilities, other miscellaneous heart punches or dies, ink, scor-pal, tissue paper, embellishments of your choice. Attach sides. They will meet in the middle, but since I planned on covering up the major seam, I didn't really worry about it. Cut 4 pieces of cardstock to cover the 4 sides of your box. 2 of 2 7/8" x 3 7/8" and 2 of 3 7/8" x 4 3/8"
Use your embossing folder to emboss all 4 pieces of cardstock. Attach your embossed cardstock to your box sides. Next, I wanted to create all my hearts. I didn't know how many I wanted, so I just cut and collected. I used my nesties both the plain and scallop heart as well as cuttlebug die I had and a Martha Stewart heart punch. I then took these hearts and before taking the cut hearts out I grabbed a sponge and sponged them with ink to create a different heart look. The point is to get a variety of shapes, designs and looks with these multiple hearts. You don't have to emboss these, just leave the dies on and sponge away. Now don't forget your focal point. I used this cute little fuzzy guy from the stamp set Monster Mash and a matching sentiment and then accented with a button and twine. Its now time to create your handles. I used the largest scallop heart and cut 2 out of my cardstock. Then I placed the next to the largest plain heart die in the middle of my scallop cut die. End result is 2 of these. Now you have the handles and all your fun heart shapes. Use a hole punch to punch a small hole in the side of the box and the tip of the scallop heart. More fun... just start attaching your hearts. I started with a flat layer and then used pop dots to attach hearts on top of the others. Remember to keep your bottom edges even. I love my cute little fuzzy guy, but I did want my bag to say Happy Valentine's Day somewhere so I grabbed the newly released set .... I took the sentiment and placed them all on a block and stamped. It was a tight fit, but I used my Martha Stewart punch to punch out the sentiment. And finally, don't forget that tissue paper. This is where those wheels come in so handy. Decorating tissue paper is so fun because it can be far from perfect. I overlap, I get crooked, it just doesn't matter. Its getting scrunched for pete's sake. I used the Tender Swirls stamp to create my sweet tissue. And here it is once again. Thanks for coming to visit today. I hope you have a wonderful Tuesday. Patricia, if you could e-mail me (Katie) at mypaperhaven@gmail.com with your stamp choice. Now for the Top 5 Inspirations. Thanks to everyone for participating and getting inspired and for inspiring all of us. Have a great weekend. Hey friends, its Katie here telling you that I'm running behind. I'm headed out - actually down to CHA today and I haven't had time to pick the random winner for last week's challenge so... if you are reading this and got the challenge done... you've got time to squeeze another go around OR if you haven't had time yet, you do now... so get a move on! It's always good to have a goal so mine is to do it tonight (late) after I get all settled. Thanks for understanding and yes, I'll try to get photos up for you guys to drool over!!! How about a little desk calendar? Clearly Inspired Challenge going on right now. There is still lots of time to play. Hey friends, its Katie here to welcome you to another tutorial Tuesday. I hope you are having a great week so far. I can't believe we are on the other side of January already, but don't worry. Even if you are running a bit behind, there is still time to get things organized for yourself. Today, I'm sharing a cute little desk calender for you to make either to give away or to keep. Once you have the basics, it will be super easy for you to adjust this to whatever dimensions you want for more decorating space or whatever. I kept it to on the smaller side. You will need 12 sheets of printer paper measuring 4" x 4 1/2". Stamp all sheets with the calendar stamp. You can choose to stamp all sheets with the 31 days and just use the extra numbers as places for extra notes or you can mask off the last numbers so they coordinate with each month. Ink and then peel tape off and stamp. Here are my calendar pages. I wanted a way to remove each month without leaving a big ugly mess so I turned to my Scor Pal and my tracing tool. I measured in 1/2" and created my perforations - do this for all 12 pages. On January's sheet, line up at the top of the Scor Pal and make marks every 1/2". These marks are where you'll punch your holes. Next, you will need a piece of cardstock measuring 4" x 12" and score at 4 1/2", 6", 7 1/2"
Then fold so it looks like a " W " from the side. Apply adhesive to what is the front of your calendar. This part isn't too terribly important since you can re-adjust your folds to create the calendar. Apply each month going backwards. Once your calendar pages are all put together, its time to punch holes. Grab a piece of colored cardstock to create the top layer. Mine measured 4" x 1 /4". I used a SU! scallop border punch. Just lay this piece over the piece that has already been punched and add your ribbon. I added a bit of interest with a stamped and cut out butterfly and added another image on the corner of each page. The great thing is that you can still write on it by just flattening the whole thing. And the pages are so easy to just tear off. And there you have it! 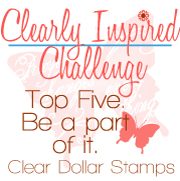 Thanks for hanging with us at Clear Dollar Stamps - this is Katie signing off for Clearly iStamp. Hey friends, welcome back for Challenge #5. This weeks' challenge is a sketch and you are free to work with it the best you can. Many of you are familiar with the challenge details, but hopefully we have some new friends so I'll continue to post all the details. Now to get your creative juices flowing, I've got some incredible samples from some of the fabulous members of our Clear Dollar Stamps design team. These ladies always inspire me with their wonderful cards and projects. Thanks and this is Katie signing off for Clearly iStamp.